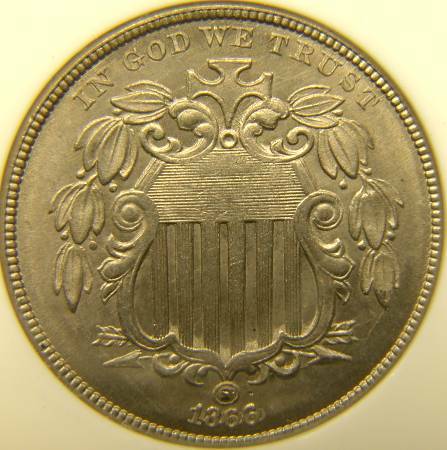 Shield nickels were minted starting in 1866, primarily in response to an extreme shortage of circulating coins. Gold and silver coinage had disappeared from circulation because their bullion value was greater than their face value. Postage stamp currency was an utter failure because they rapidly became a dirty, sticky mess. Fractional notes (shinplasters) became filthy and wore out quickly. Some merchants had issued tokens to use in commerce, but in 1864 this practice was outlawed by Congress. All of this combined to leave the cent as the only circulating coin, which greatly hindered the commerce of the nation. In search of a solution, a number of members of Congress were influenced by a man named Joseph Wharton who strongly advocated coinage made with nickel. Not coincidentally, Joseph Wharton owned a nickel mine and refinery. In 1865, Wharton's lobbying paid off when Congress approved the issuance of a new three cent piece made of 25% nickel and 75% copper. 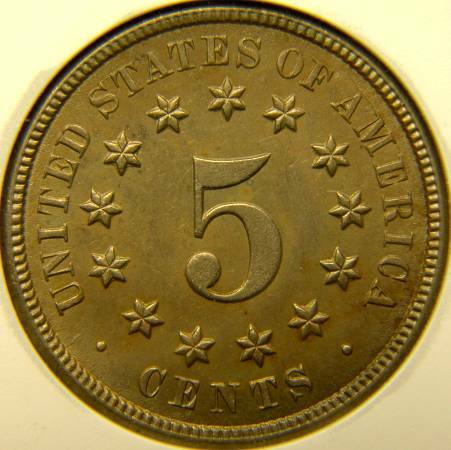 Wharton's success was doubled in 1866 when Congress approved a new five cent coin of the same composition. Despite Wharton's success in obtaining approval for minting of coins containing nickel, he was unhappy with the design approved for the five cent coin. In 1877 Wharton wrote "the diameter of this coin being too small for its weight, it has an awkward and lumpy appearance, and is entirely devoid of resonance. The design of its face strongly suggests the old fashioned pictures of a tombstone surmounted by a cross and overhung by weeping willows, which suggestion is corroborated by the religious motto. It is a curiously ugly device." 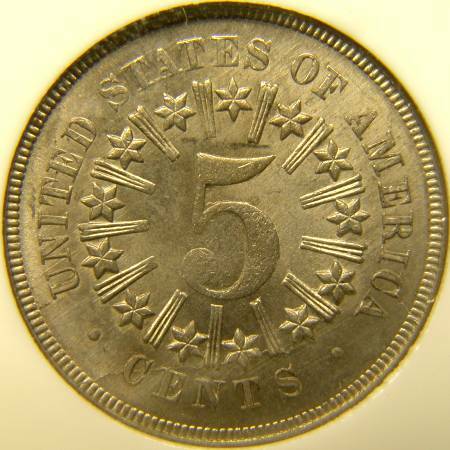 The United States Mint rapidly found themselves in difficulty when trying to produce the new five cent shield nickel. The composition of the coin was much harder than the copper, silver, and gold coins the mint was accustomed to producing. The shield nickel did have too small of a diameter - smaller than the subsequent Liberty, Buffalo, and Jefferson nickels. These factors combined to require a much higher striking pressure than usual, which caused the dies to wear out much faster than usual. Generally a shield nickel die would last for 10,000 to 15,000 strikes - contrast this with almost 400,000 strikes per typical die for a Morgan dollar. Shield nickels were produced with two major design types, a "with rays" reverse and a "no rays" reverse. 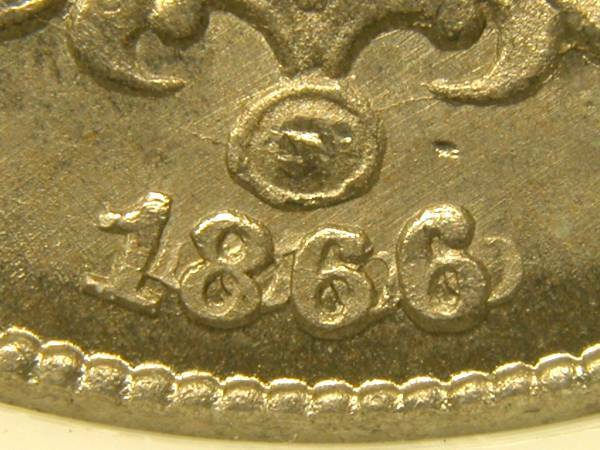 1866 nickels were struck only with rays, 1867 nickels were struck in both types (the "with rays" is more scarce), and 1868 to 1883 nickels were only struck in the "no rays" type. 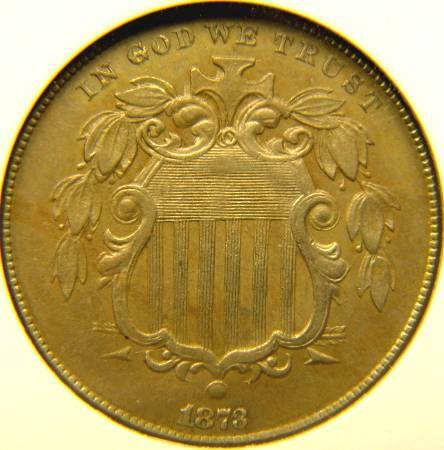 The rays on the reverse were removed in 1867 in an attempt to lower the striking pressure needed to produce the coin. 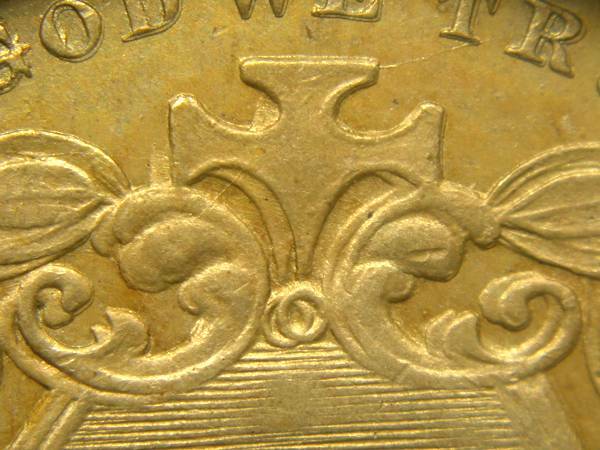 While this modification did result in nickels that were generally better struck due to improved metal flow, it did not seem to do much about prolonging die life. Because the dies wore out so quickly, the Mint had trouble producing dies fast enough to meet the need for striking the large numbers of shield nickels needed for commerce. Consequently, quality control went way down. The haste with which the dies were prepared created many outstanding die varieties, including doubled dies, repunched dates, and overdates. There are some who claim that liberal rations of rum may have contributed to the lack of quality control as well! Many dies were also used past the point at which they should have been retired, making substantial die cracks a frequent feature of shield nickels. Here we have examples of two dramatic shield nickel die varieties. The first is an 1866 with a very strong repunched date, attributed Cherrypickers' Guide FS-001, Fletcher F-08. Note the extremely wide spread of the repunching. All four digits are repunched strongly to the northeast. In the large pictures above, this 1866 is an example of the "with rays" reverse type of shield nickel. On both sides of the ball above the date you can see a small die crack. This is quite typical of shield nickels, and die cracks much larger than these are not uncommon. This coin displays very unusual doubling for a shield nickel, as most shield nickel doubled dies show doubled annulets in a north/south alignment rather than the east/west alignment of this coin. In the large pictures above, this 1873 is an example of the "no rays" reverse type of shield nickel.